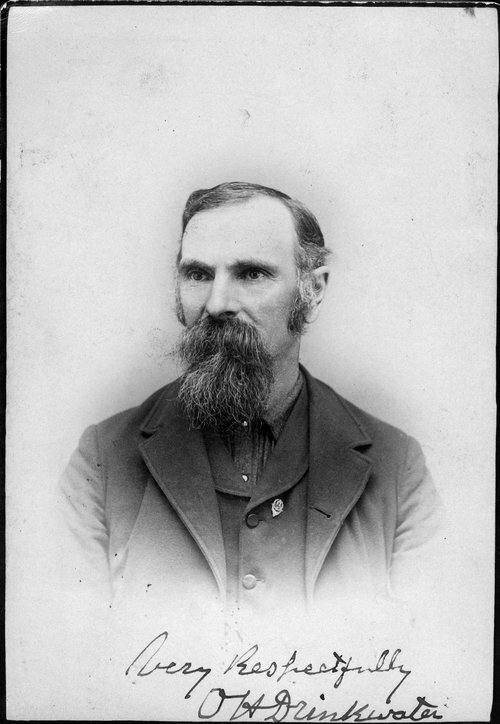 This black and white cabinet card shows Orlo H. Drinkwater,(1835-1912). An abolitionist from Pennsylvania he came to the Kansas Territory, in 1855, and settled in Topeka, Kansas. In 1857, Drinkwater moved to the town of Cedar Point in western Chase County, Kansas. He became an active member of the community by joining the Free State Party and being elected to the Free Sate legislature. From 1862-1863, Drinkwater was commissioned as a Union Captain with the Fifth Regiment of the Indian Brigade in Missouri, Arkansas and the Indian Territory. He returned to Cedar Point after the war to resume his social standings in the community. In 1867, he was appointed the county coroner of Chase County. He also built and operated a saw mill and dam along the Cottonwood River at Cedar Point. The following year, 1868, Drinkwater was elected to the Kansas House of Representatives as a Republican from the Sixty-Eighth District of Chase County. He served only one term in the legislature before returning to Chase County to continue his business ventures. In 1871, Drinkwater and business partner Petter Paul Schriver replaced their saw mill on the Cottonwood River with a limestone structure and built one of the finest milling operations in the area. For a number of years the Cedar Point Mill and Dam was a profitable business for Drinkwater and Schriver until Drinkwater sold his interest. Drinkwater, remained an active member of the Chase County community until his passing, on October 7, 1912, when at the age of seventy-seven he was struck by a bicycle while walking along the streets of Cedar Point.